The 41.58 metre sailing yacht Queen Nefertiti, listed for sale at Bernard Gallay Yacht Brokerage, has been sold with Sparkman & Stephens representing the buyer. Built in steel and aluminium by Spanish yard Astilleros Celaya to a design by Sparkman & Stephens, Queen Nefertiti was delivered in 1986 as a twin masted schooner-rigged cruising yacht and had a major rebuild between 2000 and 2005. She easily reaches 11 to 12 knots under sail and is a proven world cruiser, having journeyed through the Mediterranean, Caribbean, South America and the Arctic. She has a very large aft deck with a spacious cockpit offering built-in upholstered seating and two separate dining tables for al fresco meals, and everything is on one single level together with the deckhouse and pilot house. Interior design is by Pierre Tanter and the saloon below deck is spacious and comfortable, with large settees and armchairs, a bar and an entertainment centre with access forward to the galley and crew area. Accommodation is for eight guests and seven crew. Guest accommodation consists of two double and two twin cabins, all with en-suite shower facilities. The fact that all the guest cabins are nearly equal in size and her outstanding range could make Queen Nefertiti the perfect charter proposition for a canny buyer. Under power, a 450hp Volvo diesel engine gives her a range of 5,000 nautical miles. 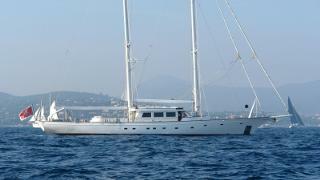 Lying in Sete in the South of France, Queen Nefertiti was asking €2,490,000.